Not to be confused with the opposite disorder (involving low blood sugar), hypoglycemia. White hexagons in the image represent glucose molecules, which are increased in the lower image. The degree of hyperglycemia can change over time depending on the metabolic cause, for example, impaired glucose tolerance or fasting glucose, and it can depend on treatment. Temporary hyperglycemia is often benign and asymptomatic. Blood glucose levels can rise well above normal and cause pathological and functional changes for significant periods without producing any permanent effects or symptoms. During this asymptomatic period, an abnormality in carbohydrate metabolism can occur which can be tested by measuring plasma glucose. However, chronic hyperglycemia at above normal levels can produce a very wide variety of serious complications over a period of years, including kidney damage, neurological damage, cardiovascular damage, damage to the retina or damage to feet and legs. Diabetic neuropathy may be a result of long-term hyperglycemia. Impairment of growth and susceptibility to certain infection can occur as a result of chronic hyperglycemia. Acute hyperglycemia involving glucose levels that are extremely high is a medical emergency and can rapidly produce serious complications (such as fluid loss through osmotic diuresis). It is most often seen in persons who have uncontrolled insulin-dependent diabetes. Frequent hunger without other symptoms can also indicate that blood sugar levels are too low. This may occur when people who have diabetes take too much oral hypoglycemic medication or insulin for the amount of food they eat. The resulting drop in blood sugar level to below the normal range prompts a hunger response. Polydipsia and polyuria occur when blood glucose levels rise high enough to result in excretion of excess glucose via the kidneys, which leads to the presence of glucose in the urine. This produces an osmotic diuresis. Hyperglycemia causes a decrease in cognitive performance, specifically in processing speed, executive function, and performance. Decreased cognitive performance may cause forgetfulness and concentration loss. In untreated hyperglycemia, a condition called ketoacidosis may develop because decreased insulin levels increase the activity of hormone sensitive lipase. The degradation of triacylglycerides by hormone-sensitive lipase produces free fatty acids that are eventually converted to acetyl-coA by beta-oxidation. 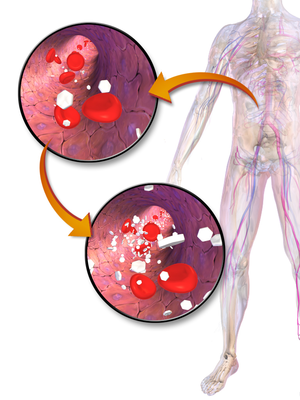 Ketoacidosis is a life-threatening condition which requires immediate treatment. Symptoms include: shortness of breath, breath that smells fruity (such as pear drops), nausea and vomiting, and very dry mouth. Chronic hyperglycemia (high blood sugar) injures the heart in patients without a history of heart disease or diabetes and is strongly associated with heart attacks and death in subjects with no coronary heart disease or history of heart failure. Also, life-threatening consequences of hyperglycemia is nonketotic hyperosmolar syndrome. Perioperative hyperglycemia has been associated with immunosuppression, increased infections, osmotic diuresis, delayed wound healing, delayed gastric emptying, sympatho-adrenergic stimulation, and increased mortality. In addition, it reduces skin graft success, exacerbates brain, spinal cord, and renal damage by ischemia, worsens neurologic outcomes in traumatic head injuries, and is associated with postoperative cognitive dysfunction following CABG. Chronic hyperglycemia that persists even in fasting states is most commonly caused by diabetes mellitus. In fact, chronic hyperglycemia is the defining characteristic of the disease. Intermittent hyperglycemia may be present in prediabetic states. Acute episodes of hyperglycemia without an obvious cause may indicate developing diabetes or a predisposition to the disorder. In diabetes mellitus, hyperglycemia is usually caused by low insulin levels (Diabetes mellitus type 1) and/or by resistance to insulin at the cellular level (Diabetes mellitus type 2), depending on the type and state of the disease. Low insulin levels and/or insulin resistance prevent the body from converting glucose into glycogen (a starch-like source of energy stored mostly in the liver), which in turn makes it difficult or impossible to remove excess glucose from the blood. With normal glucose levels, the total amount of glucose in the blood at any given moment is only enough to provide energy to the body for 20–30 minutes, and so glucose levels must be precisely maintained by the body's internal control mechanisms. When the mechanisms fail in a way that allows glucose to rise to abnormal levels, hyperglycemia is the result. Certain medications increase the risk of hyperglycemia, including corticosteroids, octreotide, beta blockers, epinephrine, thiazide diuretics, statins, niacin, pentamidine, protease inhibitors, L-asparaginase, and antipsychotics. The acute administration of stimulants such as amphetamines typically produces hyperglycemia; chronic use, however, produces hypoglycemia. Some of the newer psychiatric medications, such as Zyprexa (Olanzapine) and Cymbalta (Duloxetine), can also cause significant hyperglycemia. A high proportion of patients suffering an acute stress such as stroke or myocardial infarction may develop hyperglycemia, even in the absence of a diagnosis of diabetes. (Or perhaps stroke or myocardial infarction was caused by hyperglycemia and undiagnosed diabetes.) Human and animal studies suggest that this is not benign, and that stress-induced hyperglycemia is associated with a high risk of mortality after both stroke and myocardial infarction. The following conditions can also cause hyperglycemia in the absence of diabetes. 1) Dysfunction of the thyroid, adrenal, and pituitary glands 2) Numerous diseases of the pancreas 3) Severe increases in blood glucose may be seen in sepsis and certain infections 4) Intracranial diseases (frequently overlooked) can also cause hyperglycemia. Encephalitis, brain tumors (especially those located near the pituitary gland), brain bleeds, and meningitis are prime examples. 5) Mild to high blood sugar levels are often seen in convulsions and terminal stages of many diseases. Prolonged, major surgeries can temporarily increase glucose levels. Certain forms of severe stress and physical trauma can increase levels for a brief time as well yet rarely exceeds 6.6 mmol/l (120 mg/dl). Millimoles per liter (mmol/l) is the SI standard unit used in most countries around the world. Milligrams per deciliter (mg/dl) is used in some countries such as the United States, Japan, France, Egypt and Colombia. Glucose levels vary before and after meals, and at various times of day; the definition of "normal" varies among medical professionals. In general, the normal range for most people (fasting adults) is about 4 to 6 mmol/l or 80 to 110 mg/dl. (where 4 mmol/l or 80 mg/dl is "optimal".) A subject with a consistent range above 7 mmol/l or 126 mg/dl is generally held to have hyperglycemia, whereas a consistent range below 4 mmol/l or 70 mg/dl is considered hypoglycemic. In fasting adults, blood plasma glucose should not exceed 7 mmol/l or 126 mg/dL. Sustained higher levels of blood sugar cause damage to the blood vessels and to the organs they supply, leading to the complications of diabetes. Chronic hyperglycemia can be measured via the HbA1c test. The definition of acute hyperglycemia varies by study, with mmol/l levels from 8 to 15 (mg/dl levels from 144 to 270). Treatment of hyperglycemia requires elimination of the underlying cause, such as diabetes. Acute hyperglycemia can be treated by direct administration of insulin in most cases. Severe hyperglycemia can be treated with oral hypoglycemic therapy and lifestyle modification. In diabetes mellitus (by far the most common cause of chronic hyperglycemia), treatment aims at maintaining blood glucose at a level as close to normal as possible, in order to avoid serious long-term complications. This is done by a combination of proper diet, regular exercise, and insulin or other medication such as metformin, etc. The origin of the term is Greek: prefix ὑπέρ- hyper- "over-", γλυκός glycos "sweet wine, must", αἷμα haima "blood", -ία, -εια -ia suffix for abstract nouns of feminine gender. ^ Pais I, Hallschmid M, Jauch-Chara K, et al. (2007). "Mood and cognitive functions during acute euglycaemia and mild hyperglycaemia in type 2 diabetic patients". Exp. Clin. Endocrinol. Diabetes. 115 (1): 42–46. doi:10.1055/s-2007-957348. PMID 17286234. ^ Sommerfield AJ, Deary IJ, Frier BM (2004). "Acute hyperglycemia alters mood state and impairs cognitive performance in people with type 2 diabetes". Diabetes Care. 27 (10): 2335–40. doi:10.2337/diacare.27.10.2335. PMID 15451897. ^ Kraemer, Fredric B.; Shen, Wen-Jun (2002). "Hormone-sensitive lipase". Journal of Lipid Research. 43 (10): 1585–1594. doi:10.1194/jlr.R200009-JLR200. ISSN 0022-2275. ^ "Chronic hyperglycemia may lead to cardiac damage". Journal of the American College of Cardiology. 2012-02-03. Retrieved 3 February 2012. ^ Miller, Miller’s Anesthesia, 7th edition, pp. 1716, 2674, 2809. ^ Cetin M, Yetgin S, Kara A, et al. (1994). "Hyperglycemia, ketoacidosis and other complications of L-asparaginase in children with acute lymphoblastic leukemia". J Med. 25 (3–4): 219–29. PMID 7996065. ^ Luna B, Feinglos MN (2001). "Drug-induced hyperglycemia". JAMA. 286 (16): 1945–48. doi:10.1001/jama.286.16.1945. PMID 11667913. ^ Capes SE, Hunt D, Malmberg K, Pathak P, Gerstein HC (2001). "Stress hyperglycemia and prognosis of stroke in nondiabetic and diabetic patients: a systematic overview". Stroke. 32 (10): 2426–32. doi:10.1161/hs1001.096194. PMID 11588337. ^ Total Health Life (2005). "High Blood Sugar". Total Health Institute. Retrieved May 4, 2011. ^ Giugliano D, Marfella R, Coppola L, et al. (1997). "Vascular effects of acute hyperglycemia in humans are reversed by L-arginine. Evidence for reduced availability of nitric oxide during hyperglycemia". Circulation. 95 (7): 1783–90. doi:10.1161/01.CIR.95.7.1783. PMID 9107164. ^ Ron Walls; John J. Ratey; Robert I. Simon (2009). Rosen's Emergency Medicine: Expert Consult Premium Edition – Enhanced Online Features and Print (Rosen's Emergency Medicine: Concepts & Clinical Practice (2v.)). St. Louis: Mosby. ISBN 978-0-323-05472-0.